Energize your body and mind, activate muscle fibers and improve your athletic performance with Uplift from NLA for Her. This preworkout product provides clean and sustained energy to aid with enhancing the intensity of your workouts. Uplift from NLA for Her utilizes amino acids, energizing ingredients and a brain and body matrix that can promote optimum focus and drive so you can max out your workouts. 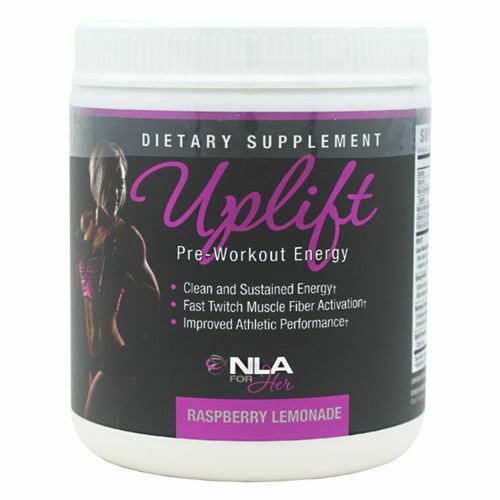 Uplift from NLA for Her can improve your mental focus and boost your overall athletic performance. Get yours today at eVitamins for a low price, and enjoy great savings! Advertências: Do not exceed recommended dose. Pregnant or nursing mothers, children under the age of 18, and the elderly and individuals with a known medical condition should consult a physician before using this or any dietary supplement. Product contains caffeine and naturally occurring caffeine, which may cause restlessness and sleep difficulty in some sensitive people. KEEP OUT OF REACH OF CHILDREN. Recomendações de uso: As a dietary supplement, mix 1 scoop (5.25 grams) with 4-8 ounces of cold water and consume 20-30 minutes before beginning activity. This is to be done the first three (3) times using "Uplift". Under no circumstances should any of the warnings be ignored. Beginning with the 3rd time using Uplift, dose may be increased by, but not more than, ½ of a scoop (2.625 grams). The ideal individual dose may vary between 1-2 scoops.